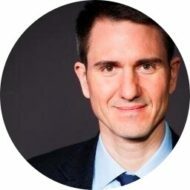 Let’s talk smartphones — mobile phones that have advanced Web browsing and multimedia capabilities. 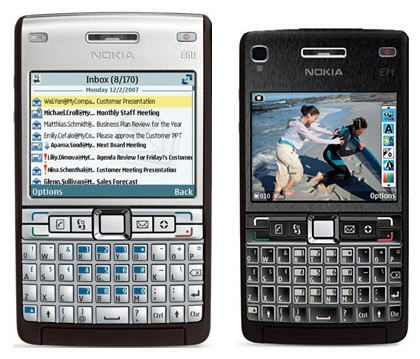 Back in December, I purchased a Nokia E71 (sample unit pictured above) here in Bangkok. Call quality: I upgraded from my candybar form factor Nokia ((I’m a loyal Nokia consumer. Their phones are typically very tough, they have good battery life, and they have a logical user interface.)) to take advantage of the E71’s bigger screen for Web browsing, as well as enhanced video and camera, among other features. So it was a pleasant surprise, then, to find out that perhaps the most notable attribute of the device is its phenomenal voice call quality. Web access: Gmail for mobile devices works very well, and Web browsing with the Opera mini browser — which you’ll need to download separately — is fantastic. Seriously, do yourself a favor and download Opera mini. It works a lot better than the built-in Nokia browser. The QWERTY keyboard is simply too small for me. It pains me to say this, since Nokia typically creates highly user-friendly phones. But there’s very little space between the keys, and some of the keys in the middle of the pad are cluttered and hard to read at a glance. The keys have Thai letters, the Roman alphabet, and numbers all crammed together. Yes, the E61 looks somewhat like a calculator. But the keys are much easier to use. This may well be my own fault, but I haven’t taken to the QWERTY keyboard. The built-in predictive text feature is decent, and it does a good job of guessing and then remembering the words you type. But I have to say I miss T9. ((Confession: I recently used my old, trusty, Nokia 3110 classic — truly a no-frills phone — while traveling, and I loved using T9 again.)) The E71 takes two hands to use; you only need one for T9-equipped devices. Radio: apparently the phone has a built-in radio, but I’ve yet to use it. 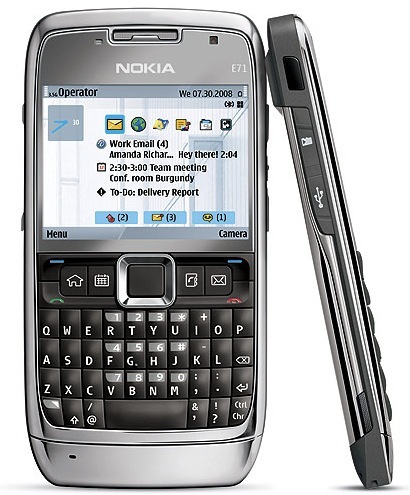 The bottom line: the Nokia E71 is a solid smartphone. Web browsing works well, and the call quality is exceptional. But unless you have very small fingers, you might find the QWERTY keypad hard to use. I received an iPhone a couple of weeks ago. I was given the option to go with a plan, or not. I went with the plan because it was cheap. I easily spend more on 12Call. As for speed… nothing on the Internet is speedy in Thailand so I was not surprised. But I can tell you this, it is one smooth piece of work. Addicting even. Picking up that slick baby and sliding your finger across the unit to wake it up is only the start of the pleasures ahead. And this from me, who didn’t want an iPhone at all. One more big reason to wait on the Thai iPhone…3G, or lack of it in the country. The 3G that there is (Bangkok and Chiang Mai, I believe) is so unreliable that the iPhone can’t be used to full capacity. Sadly, the 3G situation doesn’t look like changing for a while. I’m looking at getting a device to tide me over 12/18 months, then we’ll see how it lies. You’re right, Jon — 3G in Thailand (or lack thereof) is another reason to wait on the Thai iPhone. I have some friends who love their unlocked iPhones here, but it would seem that full 3G network access would be a serious drawback indeed.